Just a quick email to let you know about the Stampin' Up! 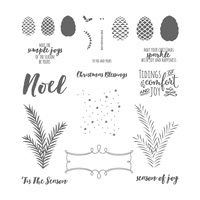 November promotion .. a new release framelits set and discounts on some gorgeous stamp sets. Plus for the month of November I am offering you free freight on your order. Not only are stitches a classic trend, they illustrate the quality, precision, and extra care taken when creating a piece. Giving a stitched gift shows just how much you value that relationship. Starting on 1 November, Stitched Shapes Framelits are available ahead of their official release in the 2017-2018 annual catalogue! 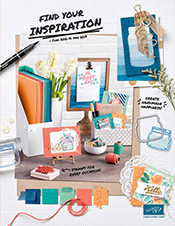 With Stitched Shapes Framelits you can make thoughtful paper stitches in seconds, turning any project into one that is stitched from the heart. 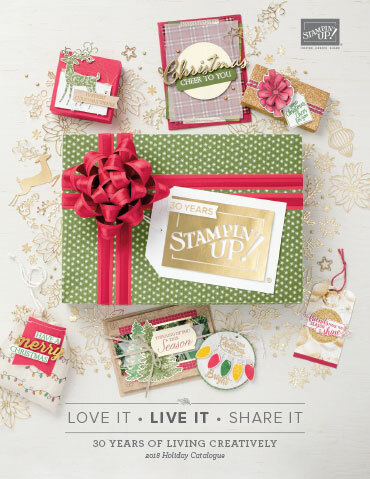 And during the month of November, coordinating stamp sets are 25% off! 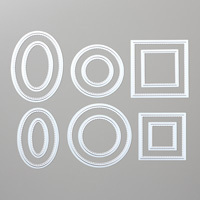 But don’t worry…Stitched Shapes Framelits will still be available for purchase after 30 November. 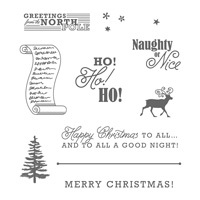 If you cannot see the images below properly, please click on the following link which will take you to the Stampin' Up! Promotions Page. If you would like to order any of the above items, please let me know by lunchtime on Thursday November 3rd. I just looked at my calendar and today my grandson James is 8 months old and he is a happy little man. I spend every Thursday looking after him and it's a delight I have to say. 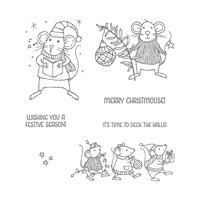 But today October 25th, also marks 8 weeks till Christmas and it is time to get a start on your Christmas cards if you haven't done so already. 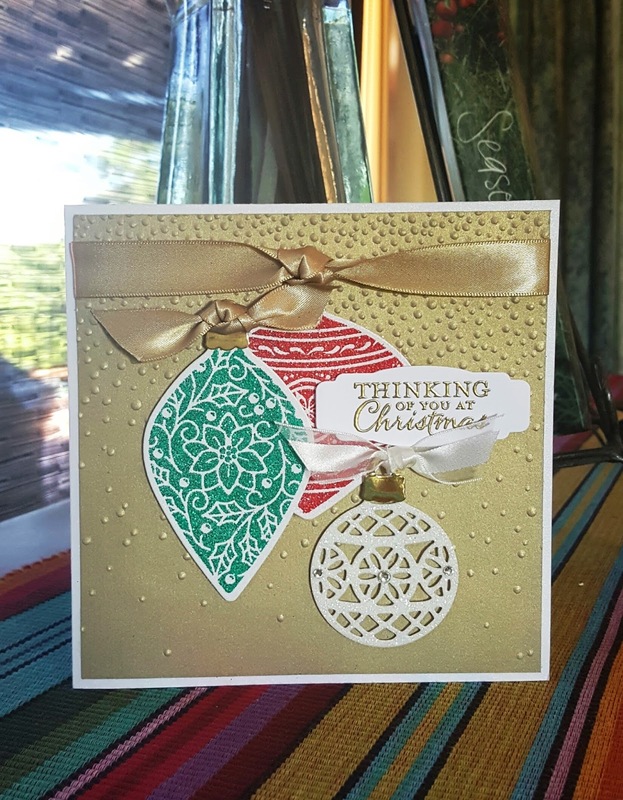 So I thought I would share one of my Christmas creations with you, using the Embellished Ornaments stamp set and the Delicate Ornaments Thinlits. 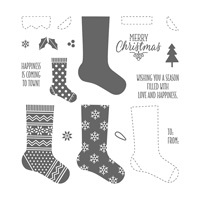 All products on the card are by Stampin' Up! apart from the little frame that showcases the greeting. It's a little hard to see here but the red and green ornaments have been stamped in Versamark and embossed with Real Red and Emerald Envy Glitter. The white ornament was die cut using Dazzling Diamonds Glimmer Paper. The gold background card was embossed with the Softly Falling Embossing Folder and the card is trimmed with Gold Sating and White Organza ribbon. I head off to New Zealand on November 12th for a wedding in Queenstown. I am looking forward to visiting the South Island but not too sure about the weather as I have a feeling it is going to be quite cool! 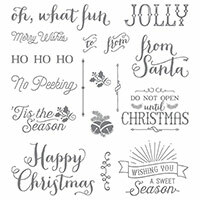 I will be away for two weeks so if you want to order supplies for your Christmas creations or any other creations, please have your orders to me by Tuesday November 1st so that I can get them to you before I leave. 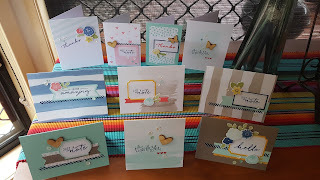 My long time crafty friend, Kerrie Gurney and I share the same birthday month so this morning I thought I would share the cards that we made for each other this year. ... and here is the card that I made for Kerrie. I know she is a lover of all things shabby chic so I went out of my comfort zone and created this card for her with a little help from a sketch found on Pinterest. 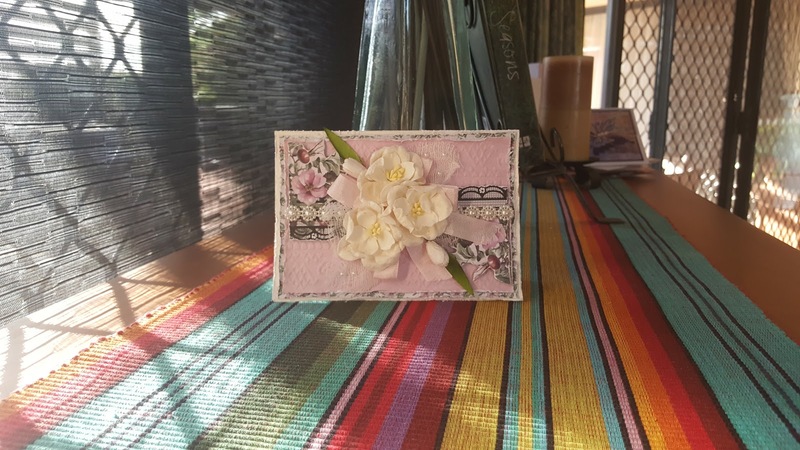 I did use some Stampin' Up! 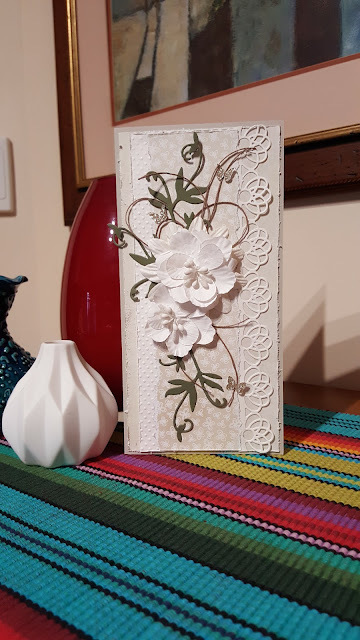 product on my card; Sahara Sand card was used for the base card, Always Artichoke for the leaves, Champagne Glimmer Paper for the tiny butterflies and Shimmery White card was used for the Doily die cut border and the spotted embossed section. You can see more of Kerrie's stunning creations by clicking over to her blog. Thank you Mrs G ... same time next year!!! My gorgeous little Grandson turned 5 on Monday and his favourite thing in the world at the moment is Tigers. So Granny ... me ... set about trying to make him a birthday card. The first card was a disaster so I decided to have another go and this version turned out way better and less scary. 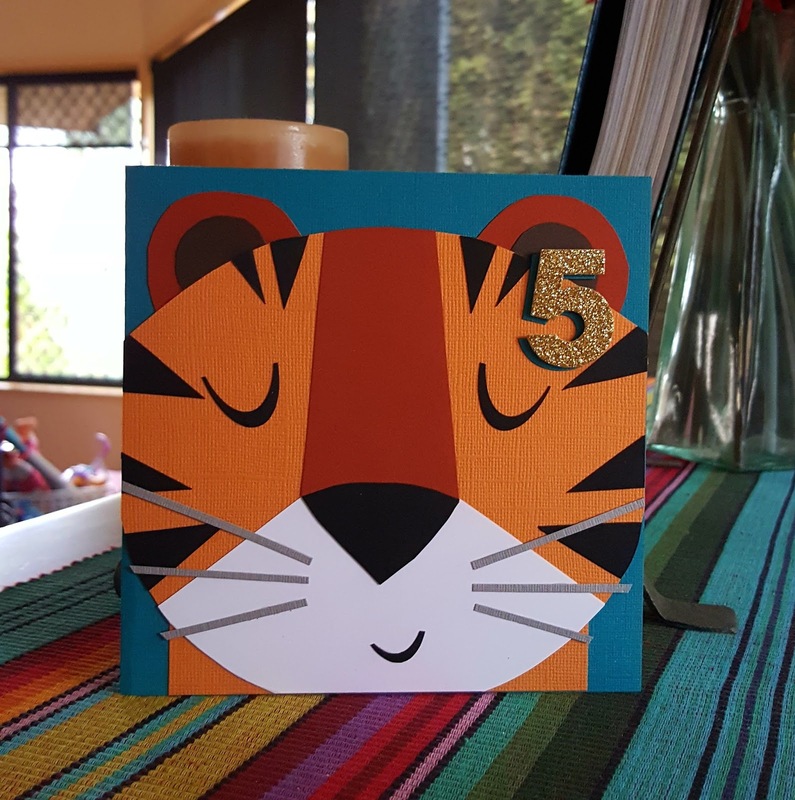 I took some inspiration that I found from a print on the net and this is how Harvey's Tiger card turned out. It's basically a lot of paper piecing and I have to say I had fun making it. 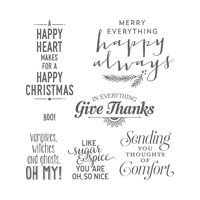 Colours used are Stampin' Up! Island Indigo, Basic Black, Whisper White, Smokey Slate, Pumpkin Pie, Cajun Craze and Early Espresso. The number 5 is from an old set of Cuttlebug dies and cut in Gold Glimmer Paper from Stampin' Up! and I have used the Large Oval punch to create his eyes and mouth. There is not one stamp on this card! Enjoy, just thought I would share because I just loved how it turned out :) . 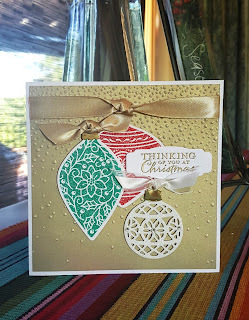 I have had my Stampin' Up! Watercolour Wishes Card Kit sitting on my desk for quite awhile waiting patiently for me to get my act together and create with. Well last night I finally did just that and here are the results. 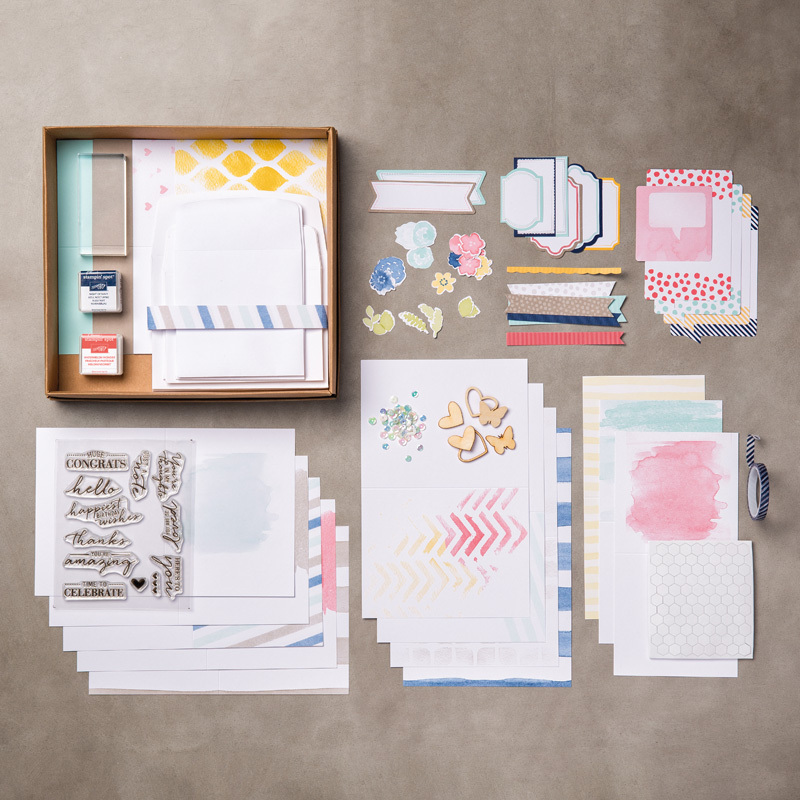 The card kit comes complete with everything you need to make 20 cards. This is just a selection of what I created, the rest have already been given to customers who have placed an order with me during the last year. You can find the complete kit on page 8 of the current catalogue and this year's kit on Page 6. You will find a link to the catalogue to the right of this post. 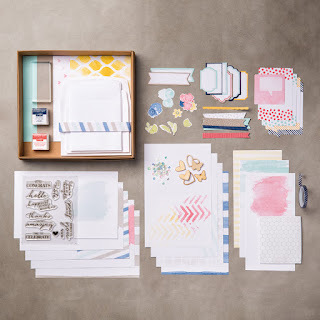 Card kits are a fabulous idea as they provide you with ink pads, embellishments, card bases, envelopes, stamps and even a coordinating block for the stamps. All you need to complete your creations is adhesive. These kits are fabulous to give as a gift to a beginner stamper or perfect to take on holidays with you should you feel the need to create whilst sitting on the balcony relaxing with a Pina Colada or two :) . 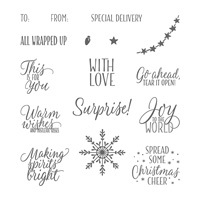 Please email me if you would like to order one of the Stampin' Up! Card kits. We are now well into the second half of 2016 and where has this year gone ... I know for me it was taken up by preparations for our overseas holiday and then finally the holiday. We were away for a period of six weeks and during that time we visited the Kingdom of the Netherlands, Germany, Austria, Hungary, Turkey, Greece and the Greek Islands and finally Italy and the United Arab Emirates on our way home. My favourite place was probably Rome and coming a close second would be the Greek Islands of Santorini and Mykonos. We covered a lot of ground in the time we were away and whilst I loved every minute of our trip I am very thankful to be home safe and sound. I cannot believe the trouble happening in Istanbul at the moment and for that matter the whole of Europe. I think tourism across Europe is probably under threat but let's not go down that track, let's get happy and let me share a card with you. 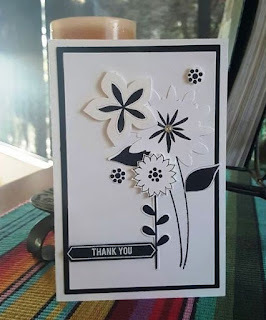 Whilst on my travels through Pinterest (lol) I came across a gorgeous black and white card and knew that I could case it using Stampin' Up's Flower Patch stamp set and Flower Fair Framelits. It is actually quite a simple card but there is a little bit of inlaid work in it which maybe hard to see in this photo. 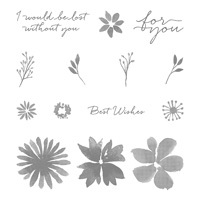 I have used Stazon Black ink on the flowers and leaves and Versamark ink with White Embossing Powder on the greeting. The greeting and white border are from the Thoughtful Banners stamp set and I have used the Classic Label punch to punch it out. Stampin' Up! once again have a special promotion happening during the month of July. For every $90.00 you spend on Stampin' Up! product you will receive a Bonus Days Coupon of $9.00 to spend during August. Whilst it might not sound a huge amount, it adds up each $90.00 you spend and it will help cover the cost of freight and discount some of your product. Well that's it from me, you know how to contact me should you like to place an order.